My son Jonathan and I trying not to lose it. This has been a scary week, the first week of a certain presidency that pushes my family and me way past the uneasy mark. But rather than give that blowhard, narcissistic, buffoon any more press today, we’re going to jump back to some old Dad Libs, our twist on the classic Mad Libs game. Micah is spending the week with the old man here and he mentioned to me that he’d like to record some new versions of these, so as we warm up for new Dad Libs episodes, here are three of our favorites from over the years. 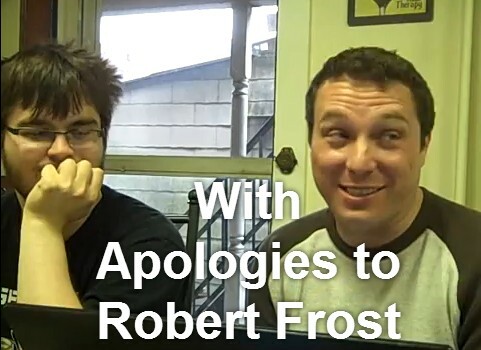 The first is from 2010 when we recorded the very first Dad Lib on my old Acer laptop, so pardon the poor quality. The next two are just, well just favorite examples of the most fun a family can have indoors without alcohol. Oh, and we seem to have a thing for butchering Robert Frost poems and great political speeches.